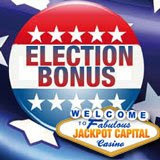 As the US presidential election 2008 grows nearer, JackpotCapital.com has dedicated its giveaways for October to the US presidential candidates. Republicans, Democrats and Independents -- JackpotCapital.com invites everyone to stamp their ballots for the upcoming elections on November 4th 2008! To collect their special six 100% deposit bonuses, players enter one of six special US Election Coupon Codes: “OBAMA” “MCCAIN “BALDWIN” “NADER” “BBARR” or “MCKINNEY” to receive at total of 6 x $100 = $600 in free cash. JackpotCapital.com offers over 300 exciting games, each with state-of-the art graphics and sound to provide a unique gaming experience. Not surprisingly, the most popular attractions at JackpotCapital.com are the large selection of games tied to the site’s huge progressive jackpots. Just like the slot machines in Las Vegas that contribute to one big mega jackpot, everyone playing card games like Caribbean Hold´em, Caribbean Stud Poker, and Let ‘Em Ride, or spinning slot machines like Midlife Crisis, Shopping Spree, Light Speed, It’s Good to Be Bad, Crazy Dragon or The Shark are contributing to huge and growing progressive jackpots.